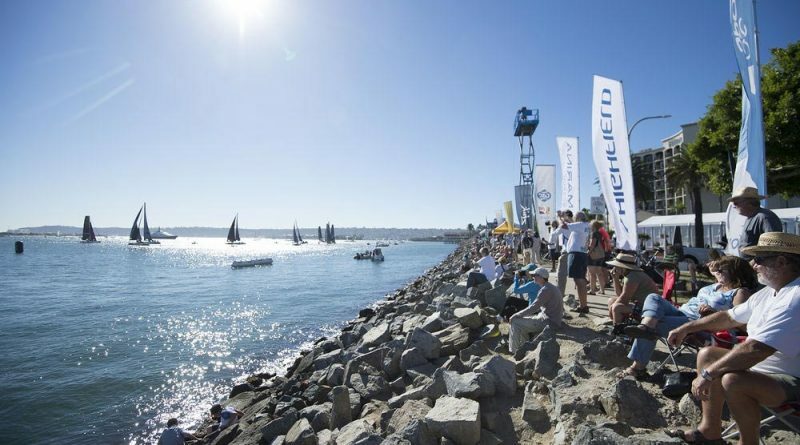 It was déjà vu for SAP Extreme Sailing Team and Alinghi as it went down to the final double-points race to decide the winner of the penultimate Act of the 2017 Extreme Sailing Series™ in San Diego, but the Danes held their nerve to walk away the champions. With tensions running high and teams pushing hard, there were two collisions within the final two races. 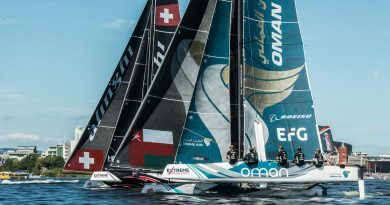 As SAP Extreme Sailing Team and Alinghi fought for pole position, a simultaneous battle for third raged between Oman Air and Red Bull Sailing Team. But the Omani syndicate fell foul of a penalty and watched Red Bull Sailing Team sail its way onto the podium. „We’re stoked. It was great to finish the double-points race with an impressive win and it sealed the week for us,“ said SAP Extreme Sailing Team helm Adam Minoprio, who sailed alongside Rasmus Køstner, Pierluigi de Felice, Mads Emil Stephensen and Richard Mason, with Jes Gram-Hansen as coach. „The last three days we’ve sailed well. Today we had a few hiccups. We put a bit of pressure on ourselves but an eight-point lead going into the final race is a good lead and it all ended well,“ added Minoprio, whose team has a five-point lead overall heading into the final Act. Although the chance of defending its 2016 Series title is now slimmer, Swiss-flagged Alinghi – currently in third in the overall standings – has made gains on Oman Air for second and is now only one point behind. „Unfortunately, we couldn’t catch up with SAP Extreme Sailing Team but we had a great battle with them on the water, so congratulations to them. We are really looking forward to Los Cabos; it’s going to be even trickier there but we still have a hand on the trophy so it’s going to be a fun one,“ said co-skipper and helm of the Swiss syndicate Arnaud Psarofaghis. Red Bull Sailing Team chipped away at Oman Air from the off, finishing ahead in the opening four races and going into the final double-points race tied on points. The Austrian squad took its chance as Oman Air was delivered a penalty and left Phil Robertson and his men for dust. 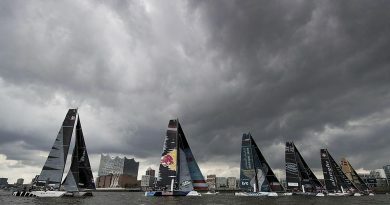 Red Bull Sailing Team remains in fourth in the overall standings. „We’re obviously a little bit disappointed to slip off the podium but it’s yacht racing,“ said Oman Air skipper Phil Robertson, whose team was awarded the Zhik Speed Machine Trophy for hitting the top speed of the Act at 29.3 knots, an insight provided by SAP. „We didn’t sail very well, and probably haven’t throughout the Act to be honest, so we’ve got some big steps to make for Los Cabos. It’s a double-points event so anything can happen,“ he added. NZ Extreme Sailing Team helm Josh Junior showed moments of brilliance, twice leading in a race before being overtaken within the final few legs. The Kiwi squad finished the Act in fifth and remains in fifth in the Series overall. An unfortunate issue with the boat meant that Land Rover BAR Academy was unable to compete in the opening two races. Re-joining the fleet in race 22, the British syndicate – which was helmed by four-time Olympic gold-medallist Sir Ben Ainslie – failed to find its form of the opening day. It finished the Act in sixth and remains in sixth in the season standings. The two US-flagged wildcards, Team Extreme San Diego and Lupe Tortilla Demetrio, took seventh and eighth on the Act leaderboard respectively. Texan entry Lupe Tortilla Demetrio will return to compete in the final stage of the season in less than six weeks‘ time. „It was so much fun sailing with this group of people in this fantastic venue all week. We made some efforts and some small strides and we started to get better but I guess we reached our peak, or at least I did personally,“ said Morgan Larson, skipper of Team Extreme San Diego and a former Series champion. „All in all, it’s always a fun experience sailing on the Extreme Sailing Series, it’s a great competition. 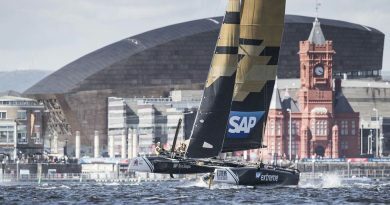 Hats off to SAP Extreme Sailing Team, they were three steps ahead of everybody and I think it will be hard work for anyone to catch them for sure,“ he added. French kiteboarder Axel Mazella stormed to victory in the inaugural Extreme San Diego Kiteboarding Invitational, with nine wins from 13 races. The first runner up was Britain’s Oliver Bridge. USA’s Johnny Heineken rounded off the podium. 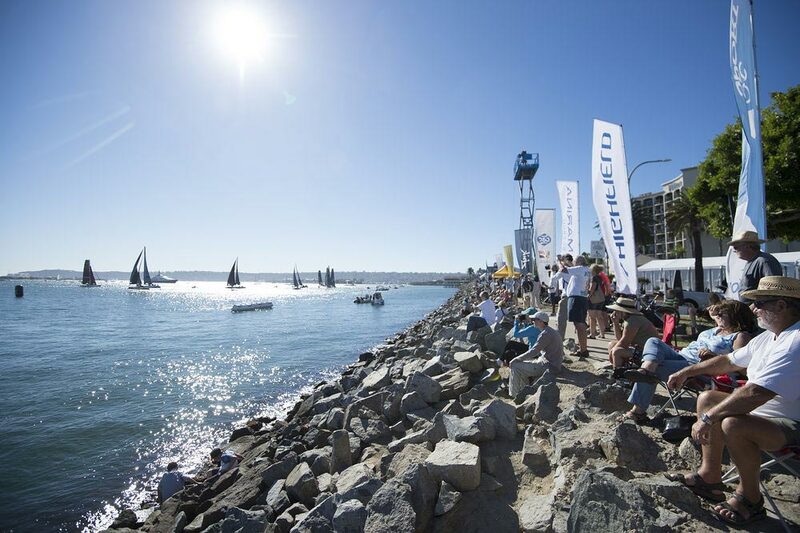 The international fleet will reconvene in Los Cabos, from 30 November – 3 December, for the double-points final Act of the 2017 season, presented by SAP. Racing will take place in front of the Breathless Cabo San Lucas Resort. Visit the official website for more information. 1st SAP Extreme Sailing Team (DEN) Rasmus Køstner, Adam Minoprio, Mads Emil Stephensen, Pierluigi de Felice, Richard Mason 273 points. 2nd Alinghi (SUI) Arnaud Psarofaghis, Nicolas Charbonnier, Timothé Lapauw, Nils Frei, Yves Detrey 263 points. 3rd Red Bull Sailing Team (AUT) Roman Hagara, Hans Peter Steinacher, Stewart Dodson, Adam Piggott, Will Tiller 239 points. 4th Oman Air (OMA) Phil Robertson, Pete Greenhalgh, James Wierzbowski, Ed Smyth, Nasser Al Mashari 233 points. 5th NZ Extreme Sailing Team (NZL) Graeme Sutherland, Josh Junior, Harry Hull, Andy Maloney, Josh Salthouse 212 points. 6th Land Rover BAR Academy (GBR) Rob Bunce, Ben Ainslie, Oli Greber, Adam Kay, Will Alloway 201 points. 7th Team Extreme San Diego (USA) Morgan Larson, Andrew Campbell, Matt Cassidy, Mike Kuschner, Cooper Dressler 198 points. 8th Lupe Tortilla Demetrio (USA) John Tomko, Jonathan Atwood, Matthew Whitehead, Tripp Burd, Trevor Burd 152 points. 1st SAP Extreme Sailing Team (DEN) 78 points. 2nd Oman Air (OMA) 73 points. 3rd Alinghi (SUI) 72 points. 4th Red Bull Sailing Team (AUT) 66 points. 5th NZ Extreme Sailing Team (NZL) 56 points. 6th Land Rover BAR Academy (GBR) 54 points. 1st Axel Mazella (FRA) 15 points. 2nd Oliver Bridge (GBR) 32 points. 3rd Johnny Heineken (USA) 42 points. 4th Joey Pasquali (USA) 49 points. 5th Riley Gibbs 49.3 points. 6th Nico Landaur (URU) 61 points. 7th Julien Kernuer (FRA) 67 points. 8th Toni Vodisek (SLO) 75 point. 9th Florian Gruber (GER) 77 points. 10th Will Cyr (USA) 100 points. 11th Kai Calder (USA) 104 points. 12th Daniela Moroz (USA) 109 points. 13th Bryan Lake (USA) 125 points. 14th Ty Reed (USA) 150 points. 15th Stefaans Viljoen (RSA) 176 points.